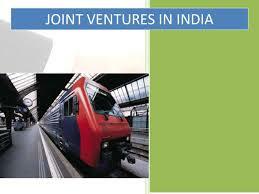 e) Proposed ‘Names’ of the Company & a brief significance of the said Names. f) Main Objects of the Proposed Company (in brief). Date of Birth Voter’s I.D. No. / Passport No. / Driving License No. Present Residential Address (With Name of State, Country & PIN Code) Corporate Identity Number (CIN) of any Indian Company wherein he is a director or promoter. b) Copy of Address Proof (Passport, Driving License, Electricity Bill, Ration Card, Telephone Bill, bank Statement etc. In case of foreign nationals / NRI’s, the said documents shall have to be notarized /apostilled by the Notary of the Home Country of the proposed director. The attesting authority must indicate the following while attesting the documents – Name in full, Signatures, Seal/Stamp & Registration No. Submit a Translated Copy (duly attested) in case the original document is in a language other than English or Hindi. 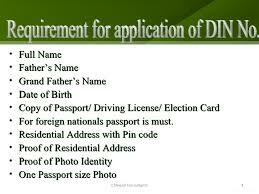 In case Identity Proof does not have date of birth and/or Father’s name, or in case the same does not tally with the DIN Application Form, additional proof (duly attested) shall have to be submitted. a) A brief details of the main objects of the proposed Company. c) To get the Memorandum and Articles signed by all the subscribers in their own hands, wherein they write their name, father’s name, occupation, address and the number of shares subscribed for. The same is to be witnessed by at least one person. d) In case of foreign nationals / NRI’s, the same shall be notarized /apostilled by the Consulate General of the Indian Embassy situated in that Country. a) Details of Directors in respect of the following: - Designation of Director (Director, Managing Director, Whole-time etc. b) Category of Director (Chairman, Executive Director or Non-Executive Director). 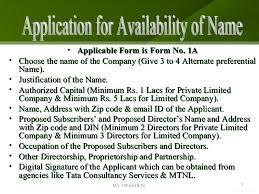 c) Complete address of the registered office of the Company (with Name of District, State, Country, Pin Code), E-Mail I.D. of Company. e) Name, Father’s Name & Present Residential Address of all subscribers. f) Documents Required: a) Consent Letter(s) signed by each director in the prescribed format. 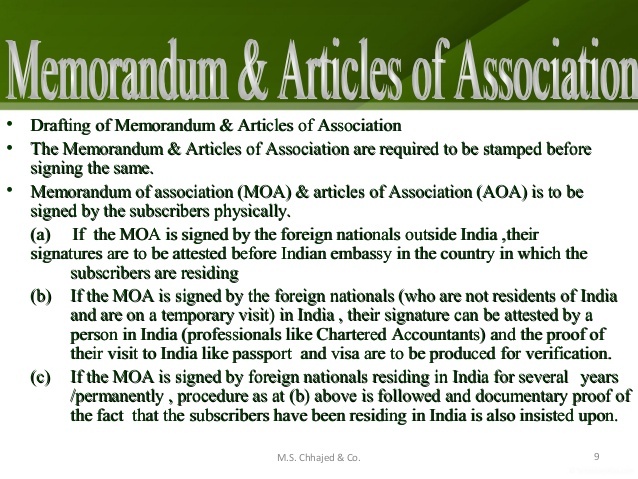 g) In case the foreign national/NRI is not available in India, then the Special Power of Attorney shall have to executed on a plain paper and notarized /apostilled by the Consulate General of the Indian Embassy situated in that Country. The SPOA holder shall further sign the SPOA and appropriate stamp duty will be paid in India. Kindly advise on the below query, I shall be thankful. If the subsidiary of foreign company purchase stake of 51% in India company, can the part of sale consideration be paid in future. Early reply will be much appreciated. In case of transfer of shares between a resident buyer and a non-resident seller or vice-versa, not more than twenty five per cent of the total consideration can be paid by the buyer on a deferred basis within a period not exceeding eighteen months from the date of the transfer agreement. For this purpose, if so agreed between the buyer and the seller, an escrow arrangement may be made between the buyer and the seller for an amount not more than twenty five per cent of the total consideration for a period not exceeding eighteen months from the date of the transfer agreement or if the total consideration is paid by the buyer to the seller, the seller may furnish an indemnity for an amount not more than twenty five per cent of the total consideration for a period not exceeding eighteen months from the date of the payment of the full consideration.